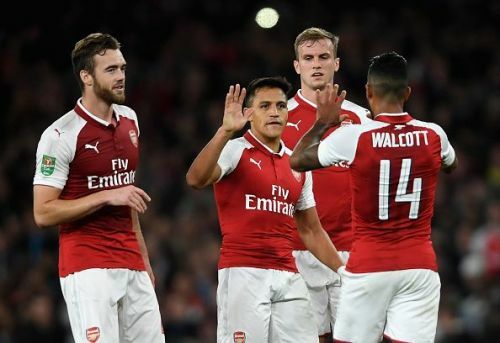 Arsenal scraped through to the fourth round of the Carabao Cup courtesy of a slender 1-0 win over Doncaster. Theo Walcott was the scorer of the solitary goal at the Emirates which saw its record lowest attendance at just over 44,000. The Gunners started the game brightly and should have been out of sight by the half-hour mark but could manage just one goal by the end. Despite a win, Arsenal had positives and negatives to take in equal measures. The first negative being their finishing. Wenger's men took 27 shots and had 10 corners in the game and yielding just one goal from that can be said as borderline disastrous. It wasn't the case as if the Rovers goalkeeper had a dream game, he made saves throughout the course of the game. During the first 30 minutes, Arsenal were quick in their passing and showed creativity with the link up play between Alexis Sanchez and Ainsley Maitland-Niles being brilliant. The second interval, however, saw a drop in the intensity as Arsenal were painfully slow in their buildup. The other negative being the game management in the final quarter of the match. At a time when Doncaster were looking dangerous, Arsenal should have shut shop and seen the game out. But, as it has been the case in recent years, Arsenal committed men forward and were short in numbers at the back. Luckily for them, the equalizer didn't come which would have caused further uproar within the fan base.